Opal L. Ruhl, 92 of Landisville, PA answered to the call of her Savior on February 18, 2018. Opal was the wife and homemaker to her late and loving husband John for 68 years. Born in 1925 and raised in Abbeville, SC she was the youngest daughter of the late Mack & Madge Leonard. She graduated from Dixie High School, Due West, SC and Greenwood College of Commerce, Greenwood, SC. She worked in banking where she met John, working in the Army Air Corps, and they were married shortly thereafter. After returning to John’s hometown of Landisville, PA they started their family of three children. She worked from home as a seamstress and had a business making and installing draperies for 35 years. She taught sewing to 4-H girls for many years, was President of Farm Women and volunteered at Lancaster General Hospital. She was active at her church, Grace Baptist Church of Lancaster. 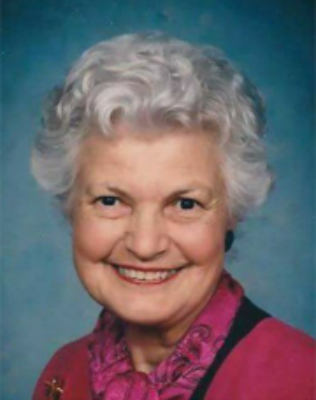 Opal will be greatly missed by her three children: John L. of Marlton, NJ, Gloria M. Gilpatrick of Cocoa, FL, and Robin R. husband of Jodi of East Petersburg. She has twelve grandchildren and five great-grandchildren. Relatives and friends are invited to attend her Celebration of Life Memorial Service at Grace Baptist Church, 1899 Marietta Ave, Lancaster, PA 17603 on Friday, February 23, 2018 at 11:00 AM with the Rev. Marvin Reich officiating. Mrs. Ruhl was one of the sweetest ladies I know. She was one of my customers at the bank and lived down the street from me. I enjoyed our chats and especially loved her southern accent and her pecan pies. She will be greatly missed but I know she rejoices in being reunited with her beloved husband John. She will be missed for sure! We have wonderful memories of her. She had wonderful southern hospitality and always made us feel loved. Now she is with Jesus her saviour and John the love of her life. You are in my prayers at this difficult time. I have fond memories of your mom (and dad) from my Jr. High and High School days when they were active in the Church of God in Landisville. Your mom was such a lovely lady. As an adult, whenever I would be back visiting Landisville, if I drove down Harrisburg Pike, I always looked over to their house and wondered if they still lived there. To me , that house will always be the Ruhl house, no matter who the current residents are. Sorry for your loss. Prayers. Sorry for your loss. Opal was a special lady that I had the privilege of meeting at Juniper Village. I thoroughly enjoyed her visiting me at the front desk with her happy smiling face! Thinking of your family. I am sorry for your loss of Opal. May the “God of all comfort” embrace you and bring to your minds joyful memories. All the best wishes for your family at this time, take care. Mac and I were sorry to hear about the passing of your mother. She was such a lovely, genteel person and I know how much you cared for her. She is with your Dad now. Please know that we are thinking of you and were sad to hear that you have left our neighborhood. What precious memories we have of your parents (AND of you three) as they joined us at ‘the woods’ for many a picnic back in 50’s, & 60’s. You have been blessed to have had her as your mother. Gone too soon, as was my mother in 1964. Live with those memories and her wonderful smile. Sincere sympathy to you all. Our families were friends for many years. Remembering Opal & John and their children with love. So sorry for your loss.